With just over 20 days left until Christmas, the Christmas Barn in Elkhorn is a great place to shop, shop, shop for everything “holidays”. This festively decorated location is the perfect place to put you in the right frame of mind to start thinking about the holidays. Enjoy browsing for crafts, jewelry, pottery, artwork, candles, greeting cards, chocolates and more. The barn features the works of a large variety of artisans, each offering something a little different and many offering items exclusively made for The Christmas Barn. The Christmas Barn is open weekends through December 23rd. Hours are Friday and Saturdays 10:00 a.m. to 5:00 p.m. and Sundays 11:00 a.m. to 4:00 p.m. Parking is plentiful and free and the facility is wheel chair accessible. Whether you are looking for a unique gift for that hard to buy for person on your list, ornaments for the kids or a special treat for yourself, The Christmas Barn has it all. So, get out there and get shopping, rumor has it that Santa can use all the help he can get! 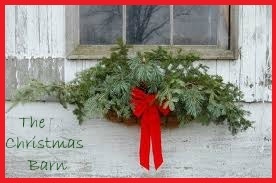 The Christmas Barn is located at N4403 County Hwy H in Elkhorn.